Let it be required to ascertain the colours of a landscape by means of impressions taken on a preparation equally sensitive to rays of every colour. Let a plate of red glass be placed before the camera and an impression taken. The positive of this will be transparent whenever the red light has been abundant in the landscape and opaque where it has been wanting. Let it now be put in a magic lantern along with the red glass and a red picture will be thrown on the screen. Let this operation be repeated with a green and a violet glass, and by means of three magic lanterns let the three images be superimposed on the screen. The colour of any point on the screen will then depend on that of the corresponding point of the landscape, and by properly adjusting the intensities of the lights, etc., a complete copy of the landscape, as far as visible landscape is concerned, will be thrown on the screen. 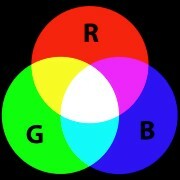 Maxwell here laid down the principles for three-colour additive photography. Using filters for the primary colours of red, green and blue in combination with monochrome photography to create three separate records would result in a full colour reproduction when those three versions of the same image were brought together. 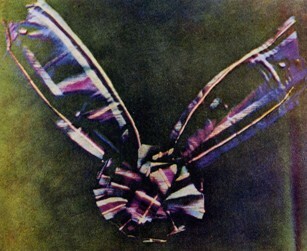 In 1861 at the Royal Institution Maxwell demonstrated the practical results of his theory, photographing a tartan ribbon through red, green and blue filters (using a very long exposure), then placing the three positive transparencies in three magic lanterns and projecting the images in synchronisation through the same colour filters (the actual photographs were taken for him by Thomas Sutton, editor of Photographic News). Maxwell’s image is therefore the world’s first colour photograph. This was of course before sensitising emulsions had been discovered, and Maxwell was using photographic plates that were insensitive to red light. However, a much later recreation of the experiment (1960) showed that both red filter and ribbon emitted ultraviolet rays, which made an impression on the photographic plate, resulting in an approximately true colour photograph. It is from Maxwell’s theorising and practical example that we can trace the history of colour cinematography, and it is the starting point for the Bioscope’s year-long series on colour in the silent era. It had of course been the dream of those involved in the early years of photography to come up with a means of capturing colour, and assorted methods of adding artifical colours to photographs were employed throughout the nineteenth century. However, true colour was the goal, and various efforts were made to record colour directly in the same way that monochrome photography operated. It was Maxwell’s experiment that demonstrated an indirect, practical solution – taking the three primary records, red, green and blue, and adding them together (hence the term ‘additive’), working on principles of colour vision developed early in the nineteenth century by Thomas Young. Other scientists then followed, refining Maxwel’s ideas, including Louis Ducos Du Hauron, Charles Cros and H.W. Vogel (who in the 1870s and 1880s discovering methods of greatly sensitising photographic plates to different colours). But most significant in the stages of experimentation that would eventually lead not only to a practical system of colour photography but for colour cinematography as well was Frederic Ives, who will be the subject of part two of this series.